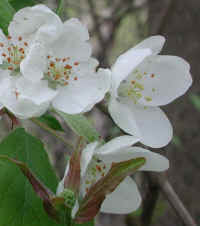 (Apple, Wild Crab or Crabapple (Malus spp.) 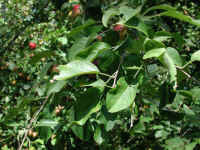 - 01) This is a branch of wild crab apple tree with ripening small red apples. We have not been able to classify the exact species, but have separated them from the wild domesticated apples (Apple, Wild) because of the small size of the apples and their tart flavor. (Apple, Wild Crab or Crabapple (Malus spp.) 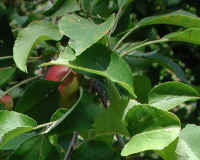 - 01a) In this photo we have a closer look at a few of the small red apples "hiding" under the saw-toothed or serrated leaves. The fully ripened apples usually don't get larger than 1 inch in diameter, though in some species they may be as large as 2 inches in diameter. 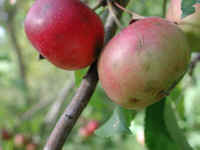 Crabapple trees are members of the rose family, Rosaceae. (Apple, Wild Crab or Crabapple (Malus spp.) - 02) This is a close up look at two of the nearly fully ripened one inch diameter crab apples. (Apple, Wild Crab or Crabapple (Malus spp.) - 03) Every spring the wild crab apple trees brighten up the roadsides and open woodlands with their copious five petal flowers. (Apple, Wild Crab or Crabapple (Malus spp.) 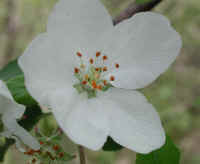 - 04) This is another look at some of the wild crab apple flowers. 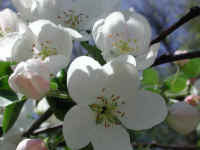 (Apple, Wild Crab or Crabapple (Malus spp.) 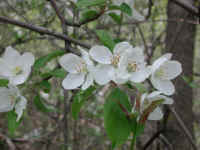 - 04a) This is a closer look at some of the wild crabapple flowers with their five petals and numerous stamens. 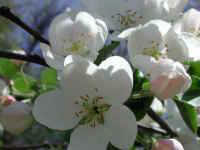 (Apple, Wild Crab or Crabapple (Malus spp.) - 04b) This is another look at the wild crab apple flowers that God created to bring joy to our hearts, spirits and souls, but unfortunately most humans have not extended this same joy to the rest of creation. Crabapple trees do no harm, but most of humanity have inflicted unspeakable harm on our fellow human beings, the animals, and the environment. We need to learn from the beauty of God's creation, that we can return to a truly peaceful way of living, if we begin to cherish and protect every aspect of God's creation. (Apple, Wild Crab or Crabapple (Malus spp.) 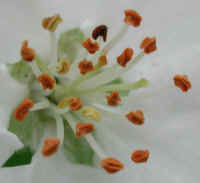 - 05) This is a closer look at one of the wild crab apple tree flowers. (Apple, Wild Crab or Crabapple (Malus spp.) 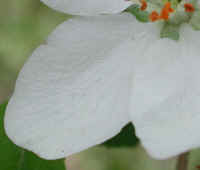 - 05a) This is a bee's eye view of the stamens of the wild crab apple flower. (Apple, Wild Crab or Crabapple (Malus spp.) 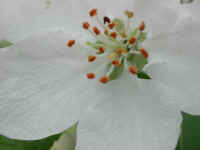 - 05b) In this bee's eye view, we can see the soft wrinkled texture of a wild crab apple flower petal. (Apple, Wild Crab or Crabapple (Malus spp.) 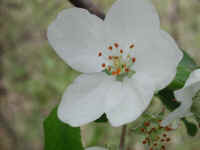 - 06) This is another close up look at a wild crab apple flower. (Apple, Wild Crab or Crabapple (Malus spp.) 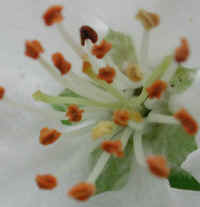 - 07) This is another bee's eye view of a wild crab apple flower with its pistil surrounded by numerous stamens. (Apple, Wild Crab or Crabapple (Malus spp.) - 07a) In this bee's eye view of the center of a wild crab apple flower, we tried to focus in on the pistil, which is facing toward the left of the photo. (Apple, Wild Crab or Crabapple (Malus spp.) 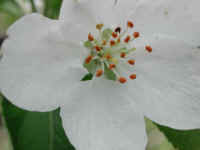 - 08) This is another close up look at a wild crab apple flower. (Apple, Wild Crab or Crabapple (Malus spp.) 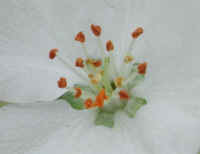 - 08a) This is another bee's eye view of the pistil and stamens of a wild crab apple flower.